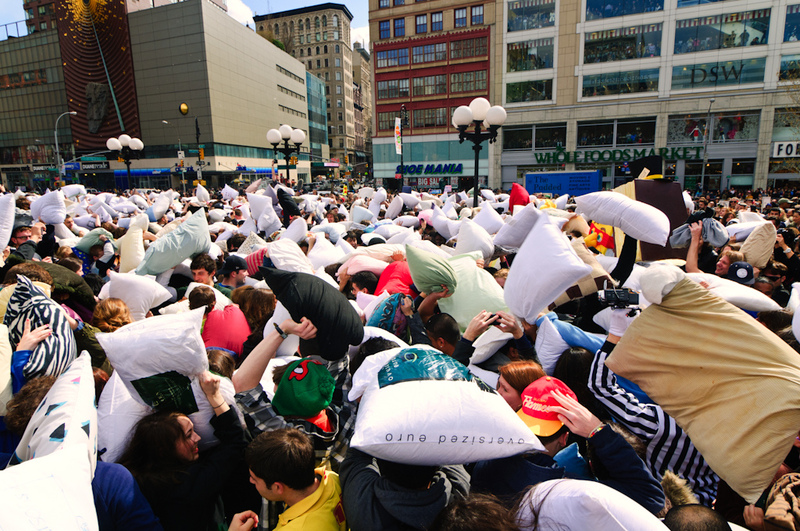 On Saturday, April 7th 2012, there will be massive pillow fights in cities around the world! 2. Don’t be in location until the exact minute. 5. After 15mins of excruciating fun, leave. The City of Vancouver and the Vancouver Police have had to take a more stern stance on events following the Stanley Cup riots. In an effort to keep this event alive and well for another 7 years we need to show responsibility in reducing our impact to the site. Over the last 7 years we have sadly watched many cities (and even countries) ban flash mobs. In Vancouver, we have a well standing history with the city to allow social events like this to happen, but only if we can stay in control. This means cleaning up after ourselves. – Put a garbage bag into your back pocket and stay afterwards. – Gloves and handheld brooms work well for the little bits. – Stay off the street. – Leave a space for pedestrians to get by. 2) Glasses – This should go with out saying but in a few other cities last year it was commented on. Take them off if you don’t want them broken. 4) Show restraint. We’ve seen more and more children show up at these events. Please consider who you’re facing off against and use common sense.